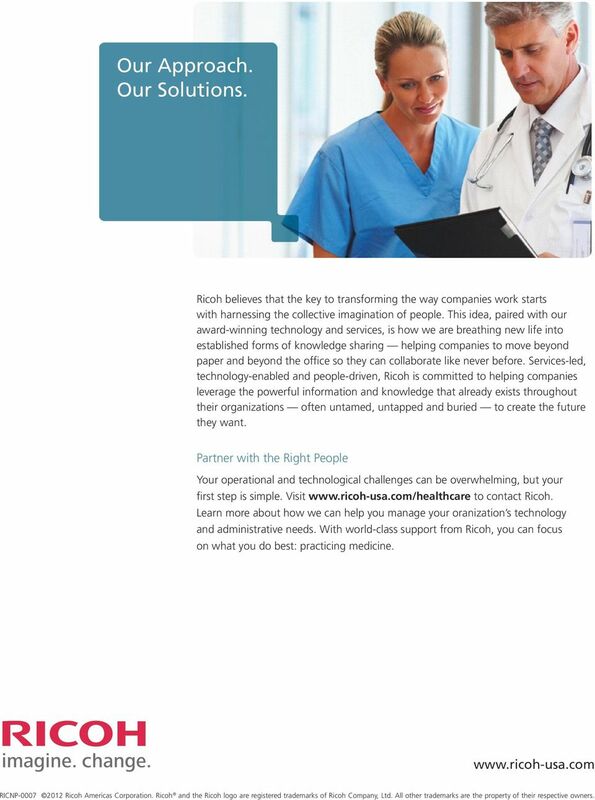 Download "Ricoh Healthcare. Process Optimized. Healthcare Simplified." 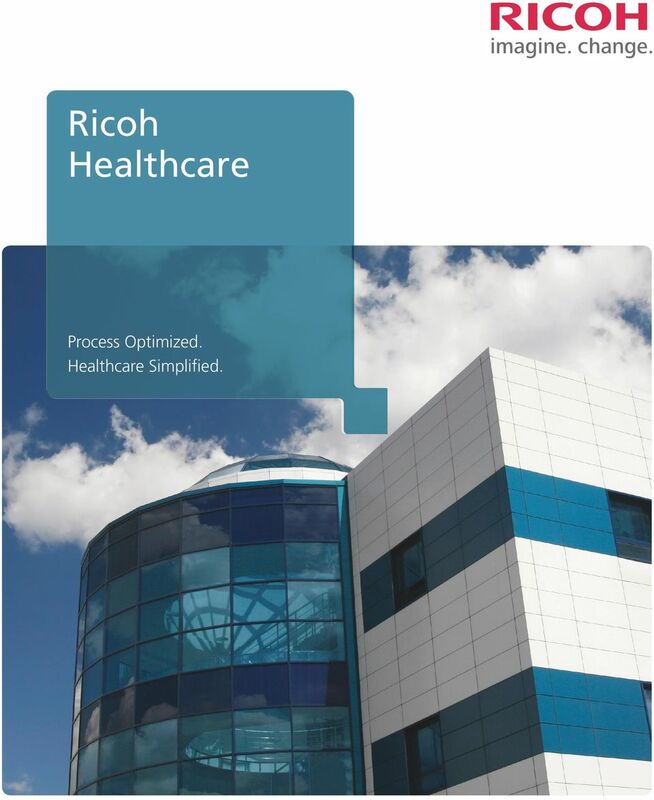 1 Ricoh Heathcare Process Optimized. Heathcare Simpified. 2 Rather than a destination that concudes with the eimination of a paper, the Paperess Maturity Roadmap is a continuous journey to strategicay remove paper from your organization. 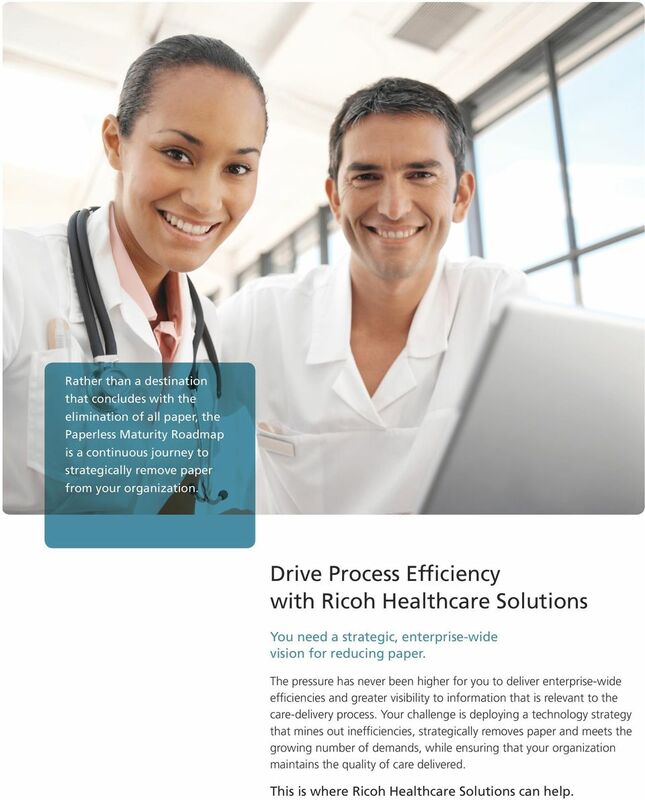 Drive Process Efficiency with Ricoh Heathcare Soutions You need a strategic, enterprise-wide vision for reducing paper. The pressure has never been higher for you to deiver enterprise-wide efficiencies and greater visibiity to information that is reevant to the care-deivery process. Your chaenge is depoying a technoogy strategy that mines out inefficiencies, strategicay removes paper and meets the growing number of demands, whie ensuring that your organization maintains the quaity of care deivered. This is where Ricoh Heathcare Soutions can hep. 3 Mutipe and Competing Priorities The heathcare industry is undergoing vast and significant technoogy changes from a number of market infuences a of which have an impact on your organization s abiity to deiver quaity care. The ist of factors can be quite daunting: Rising heathcare costs are forcing you to find more cost-effective methods of deivering care New government egisation and incentive programs, such as Meaningfu Use and Pay-for-Performance initiatives, are demanding technoogy-driven efficiencies Consoidation within the provider community is increasing the compexity of your technoogy infrastructure Shrinking budgets dictate a do more with ess mentaity The digita age requires more enhanced security measures that better protect patient heath information With so many projects, initiatives and demands happening simutaneousy, it becomes difficut for you to define where one ends and another begins. Your organization ooks to you for direction, but the increasing pressure from mutipe sources makes prioritizing these activities a of them competing for what imited resources are avaiabe neary impossibe. 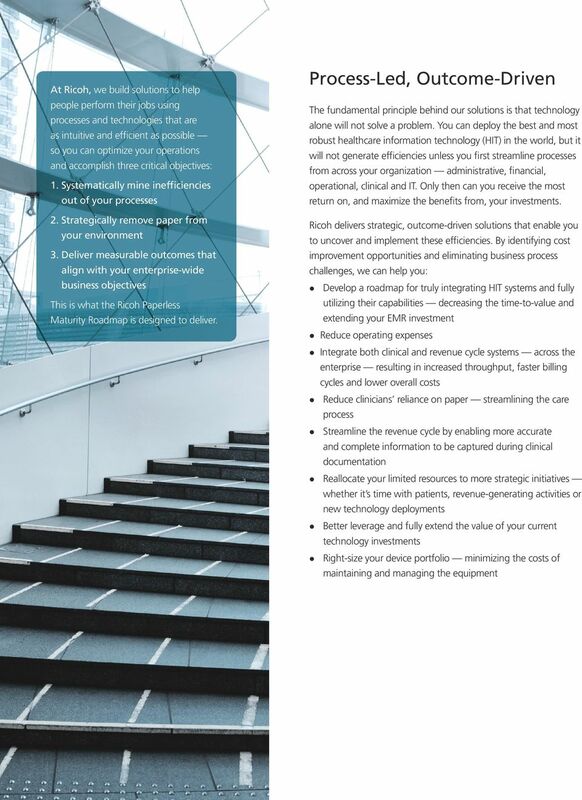 Ricoh understands the chaenges you are facing and has deveoped a suite of strategic services and soutions designed specificay for heathcare providers that can be taiored to meet the needs of your organization. By engaging Ricoh expertise and adopting our Paperess Maturity Roadmap, you can reaize the efficiencies that convert your chaenges into competitive advantages. CASE STUDY University of Louisvie Hospita Chaenge The University of Louisvie Hospita (ULH), a 400-bed acute and trauma care hospita with more than 3,400 cinicians and staff, was undergoing a transition to a new heath information system and wanted to address chaenges in a number of areas: Patient safety issues regarding faxed and handwritten medication orders to its pharmacy Lack of standardized forms management IT department over burdened with non-strategic, tactica projects Growing voume of paper patient records for its HIM department to manage Soution After consuting with Ricoh, ULH: Created a document management soution to compement its Computerized Physician Order Entry (CPOE) soution in its pharmacy Impemented a print-on-demand soution for a forms Outsourced mutifunction device and printer management, freeing IT to focus on strategic initiatives Outsourced the imaging of the fina patient record, enabing HIM to reaocate its imited resources Resuts It is projected that ULH has the potentia to reaize an overa savings of up to $1.6 miion over the ife of the contract. In addition, the impact of the soutions has increased interna customer satisfaction within the IT and HIM departments. 4 At Ricoh, we buid soutions to hep peope perform their jobs using processes and technoogies that are as intuitive and efficient as possibe so you can optimize your operations and accompish three critica objectives: 1. Systematicay mine inefficiencies out of your processes 2. Strategicay remove paper from your environment 3. Deiver measurabe outcomes that aign with your enterprise-wide business objectives Process-Led, Outcome-Driven The fundamenta principe behind our soutions is that technoogy aone wi not sove a probem. You can depoy the best and most robust heathcare information technoogy (HIT) in the word, but it wi not generate efficiencies uness you first streamine processes from across your organization administrative, financia, operationa, cinica and IT. Ony then can you receive the most return on, and maximize the benefits from, your investments. Ricoh deivers strategic, outcome-driven soutions that enabe you to uncover and impement these efficiencies. By identifying cost improvement opportunities and eiminating business process chaenges, we can hep you: Deveop a roadmap for truy integrating HIT systems and fuy utiizing their capabiities decreasing the time-to-vaue and extending your EMR investment Reduce operating expenses I ntegrate both cinica and revenue cyce systems across the enterprise resuting in increased throughput, faster biing cyces and ower overa costs Reduce cinicians reiance on paper streamining the care process Streamine the revenue cyce by enabing more accurate and compete information to be captured during cinica documentation Reaocate your imited resources to more strategic initiatives whether it s time with patients, revenue-generating activities or new technoogy depoyments Better everage and fuy extend the vaue of your current technoogy investments Right-size your device portfoio minimizing the costs of maintaining and managing the equipment This is what the Ricoh Paperess Maturity Roadmap is designed to deiver. 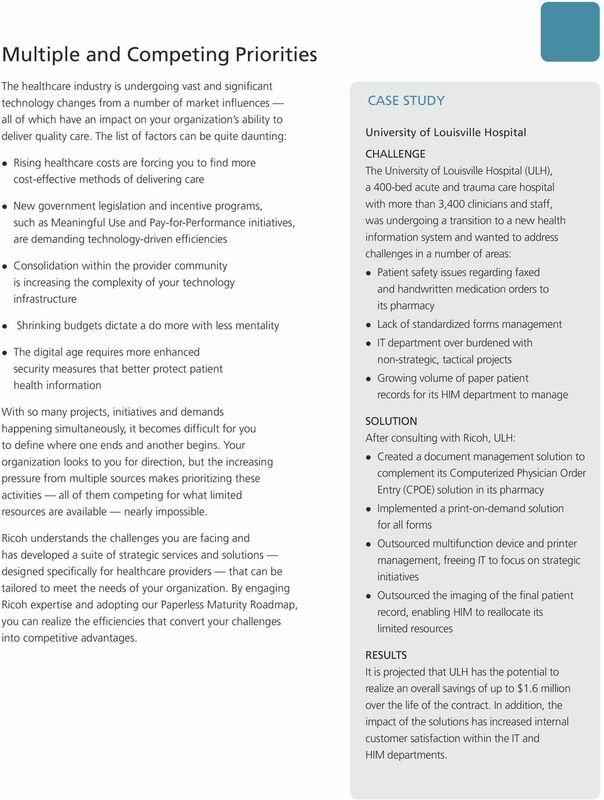 5 The Paperess Maturity Roadmap Achieving a competey paperess environment within a heathcare setting is an unreaistic expectation. 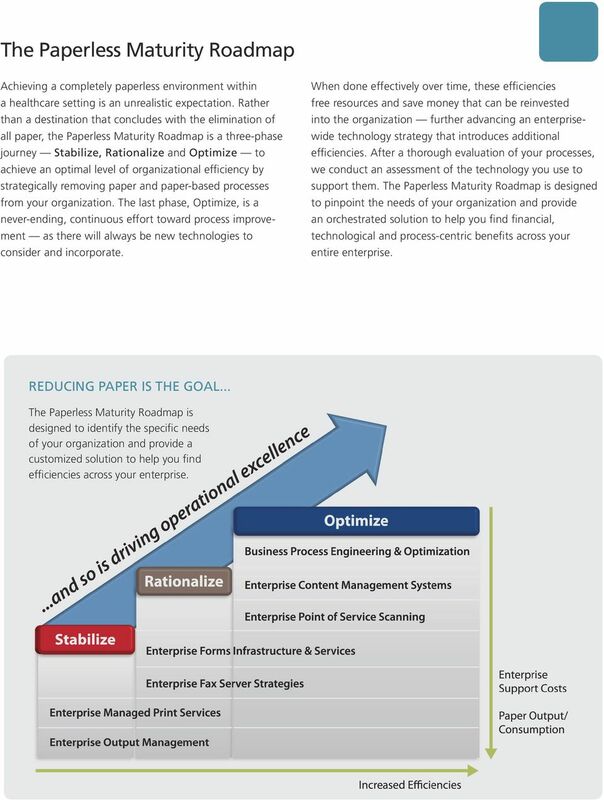 Rather than a destination that concudes with the eimination of a paper, the Paperess Maturity Roadmap is a three-phase journey Stabiize, Rationaize and Optimize to achieve an optima eve of organizationa efficiency by strategicay removing paper and paper-based processes from your organization. The ast phase, Optimize, is a never-ending, continuous effort toward process improvement as there wi aways be new technoogies to consider and incorporate. When done effectivey over time, these efficiencies free resources and save money that can be reinvested into the organization further advancing an enterprisewide technoogy strategy that introduces additiona efficiencies. After a thorough evauation of your processes, we conduct an assessment of the technoogy you use to support them. The Paperess Maturity Roadmap is designed to pinpoint the needs of your organization and provide an orchestrated soution to hep you find financia, technoogica and process-centric benefits across your entire enterprise. Reducing paper is the goa... The Paperess Maturity Roadmap is designed to identify the specific needs of your organization and provide a customized soution to hep you find efficiencies across your enterprise. 6 Ricoh s Approach to Efficiency The Ricoh Paperess Maturity Roadmap is the means to identify process efficiencies. Each of the facets within this methodoogy represents a service, soution or technoogy designed specificay for a heathcare setting. Depending on your current infrastructure and your immediate and ong-term needs, one or more of these facets can be depoyed within your organization. With each facet that s added, you can reaize another ayer of efficiency further improving processes, removing paper and generating cost savings. The foowing is an overview of the approach that we use to make the efficiencies of the Paperess Maturity Roadmap avaiabe to you: With Our... Enterprise Output Management You can... Reaize an optima print architecture that simpifies the support and management of compex HIT systems. Enterprise Managed Print Services Outsource the management and support of a print and output devices across your enterprise. Enterprise Fax Server Technoogy Impement a secure, shared fax server gateway for a outputs from the hundreds of cinica and revenue cyce appications running across your organization. 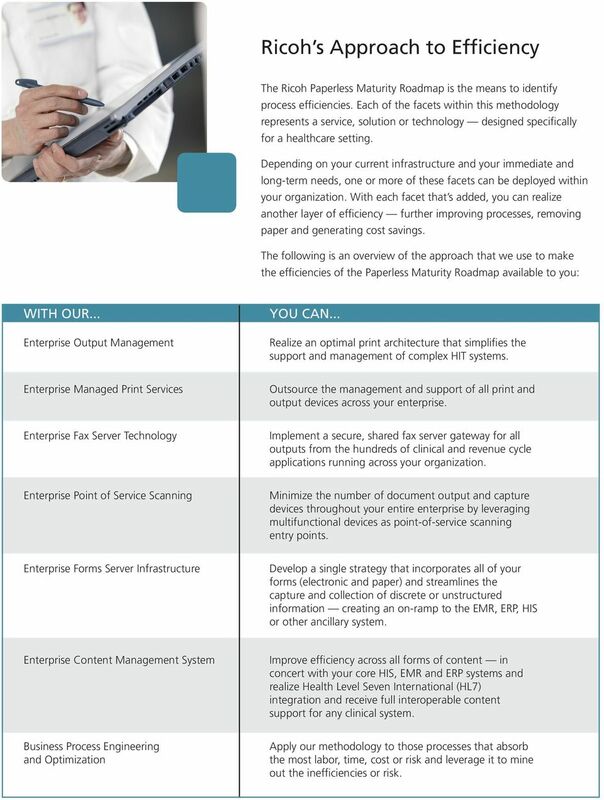 Enterprise Point of Service Scanning Minimize the number of document output and capture devices throughout your entire enterprise by everaging mutifunctiona devices as point-of-service scanning entry points. Enterprise Forms Server Infrastructure Deveop a singe strategy that incorporates a of your forms (eectronic and paper) and streamines the capture and coection of discrete or unstructured information creating an on-ramp to the EMR, ERP, HIS or other anciary system. Enterprise Content Management System Improve efficiency across a forms of content in concert with your core HIS, EMR and ERP systems and reaize Heath Leve Seven Internationa (HL7) integration and receive fu interoperabe content support for any cinica system. Business Process Engineering and Optimization Appy our methodoogy to those processes that absorb the most abor, time, cost or risk and everage it to mine out the inefficiencies or risk. 7 Why Ricoh? You need a company that can get to the core of the most difficut heathcare chaenges. With a egacy of document management soutions and strategic acquisitions, we can bring you best-in-cass process modes that deiver resuts. Here s how: A Consutative Approach Our approach begins by taking a strategic and hoistic view of your organizationa chaenges. We then work with you to define your desired business outcomes and everage your current technoogy investment as the foundation of your soution. We do this through a proven methodoogy a hybrid approach everaging the best of Lean and Six Sigma that identifies waste and variabiity within your existing processes. We then reengineer them as efficienty as possibe utiizing your existing technoogy deivering quantifiabe improvements in weeks, not months or years. No company is better suited to heping you mine inefficiency out of document-based processes than the one with a egacy of document management soutions at its core. Rapid Process Assessment Through our Rapid Process Assessment (RPA) a unique, state-of-the-art heathcare diagnostic and process simuation anaysis too you can gain access to benchmarking, predictive modeing and process diagnoses and anaytics that identify and quantify cost-saving opportunities. The RPA is a highy effective, highy visua too that provides a soid foundation for making critica business decisions. Most importanty, the RPA is minimay invasive in your day-to-day operations. 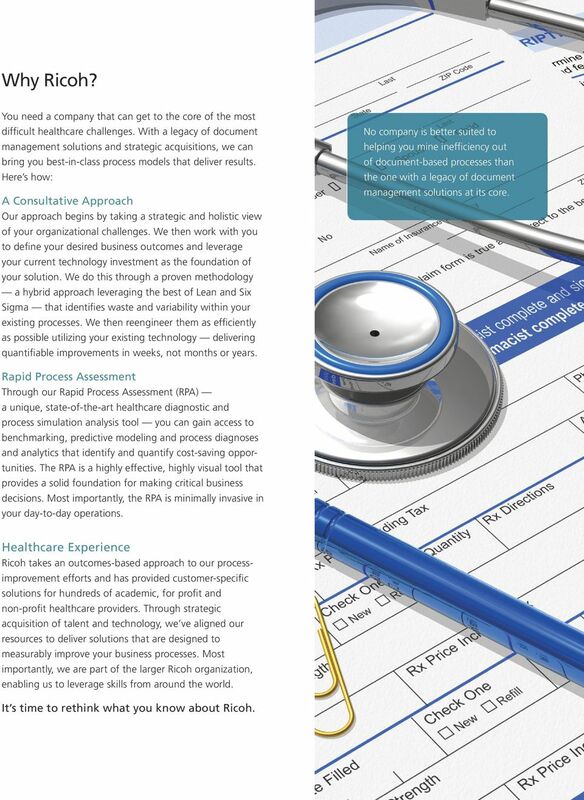 Heathcare Experience Ricoh takes an outcomes-based approach to our processimprovement efforts and has provided customer-specific soutions for hundreds of academic, for profit and non-profit heathcare providers. Through strategic acquisition of taent and technoogy, we ve aigned our resources to deiver soutions that are designed to measuraby improve your business processes. Most importanty, we are part of the arger Ricoh organization, enabing us to everage skis from around the word. It s time to rethink what you know about Ricoh. 8 Our Approach. Our Soutions. Ricoh beieves that the key to transforming the way companies work starts with harnessing the coective imagination of peope. This idea, paired with our award-winning technoogy and services, is how we are breathing new ife into estabished forms of knowedge sharing heping companies to move beyond paper and beyond the office so they can coaborate ike never before. Services-ed, technoogy-enabed and peope-driven, Ricoh is committed to heping companies everage the powerfu information and knowedge that aready exists throughout their organizations often untamed, untapped and buried to create the future they want. Partner with the Right Peope Your operationa and technoogica chaenges can be overwheming, but your first step is simpe. Visit to contact Ricoh. Learn more about how we can hep you manage your oranization s technoogy and administrative needs. With word-cass support from Ricoh, you can focus on what you do best: practicing medicine. RICNP Ricoh Americas Corporation. Ricoh and the Ricoh ogo are registered trademarks of Ricoh Company, Ltd. A other trademarks are the property of their respective owners.